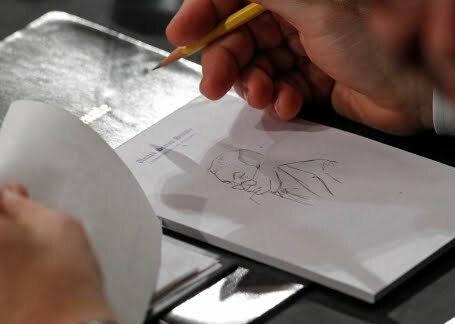 It shows Minnesota Senator Al Franken doodling while the hearings are taking place. This has been remarked on positively and negatively, and while we won't touch the partisan politics, we do believe that this photo illustrates (pun intended) a point. This is why, when we design meetings, in addition to any structured workbooks, sheets, etc., we always suggest blank notebooks. It appeals to the kinesthetic learner--those who need to move to learn. Some people will write notes (and even if they never look at them again, the act of writing them down helps cement the knowledge), some people will doodle (forming strong visual associations in their mind along with keeping their hands busy and brain focused) and others won't use them/don't need them. Whatever the audience's personal involvement with their notebook, everyone needs the option of having a space to physically write, doodle, draw, note-take. It doesn't mean that their attention has waned, in fact, quite the opposite. "We Have Met the Enemy, and He is PowerPoint"
While perusing the news, I came across this article in the New York Times about the U.S. Military rallying against PowerPoint as an instructional tool. 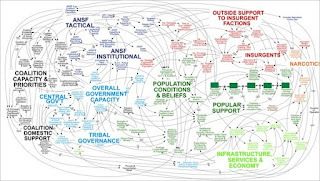 The slide to the left was used to explain military strategy. Do you get it? Apparently, neither does anyone else--showing the striking lack of clarity that relying on PowerPoint can bring to a presentation. Gen. H. R. McMaster, who banned PowerPoint presentations. . . [likened] PowerPoint to an internal threat. 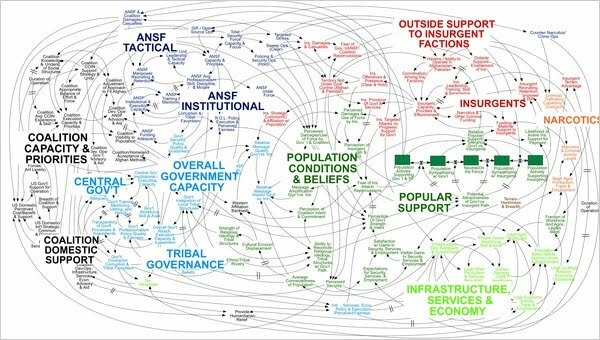 Commanders say that the slides impart less information than a five-page paper can hold, and that they relieve the briefer of the need to polish writing to convey an analytic, persuasive point. Imagine lawyers presenting arguments before the Supreme Court in slides instead of legal briefs. Senior officers say the program does come in handy when the goal is not imparting information. Sitting through PowerPoint can be agony. PowerPoint relieves the speaker of the responsibility to convey a concise, persuasive point. PowerPoint is great when the goal is not imparting information. And yet, PowerPoint is used almost exclusively in corporate presentations. What we've seen through the years has been right in line with the impressions of the article. Speakers all too often use PowerPoint as a crutch, and all too often, the PowerPoint itself hinders the ability to convey information--which is the opposite of its intention. “There’s a lot of PowerPoint backlash, but I don’t see it going away anytime soon,” said Capt. Crispin Burke, an Army operations officer at Fort Drum, N.Y. It's not going away in the corporate space anytime soon either. So what can we do about it? Find the best ways to use PPT as a TOOL instead of an obtusification device. I've spoken a lot about PowerPoint on this blog here, giving tips such as making PPTs clean, clear, concise, not having them be speaking notes, etc. Those are just a start. Perhaps we need to seriously rethink our stance on PPT as a given--or cut back drastically. After all, if the military can see it, shouldn't a CEO/VP/VIP? Live Spark has joined the ranks of millions on Facebook! Become a fan, and you'll see extra pictures, updates and more, plus a feed from our blog and twitter pages. It's a one-stop place for Live Spark news and updates--along with trends and industry tools that we've spotted.